Mr. Springer is a 1998 graduate of the University of Michigan Law School and chairperson of the firm’s Litigation practice group. 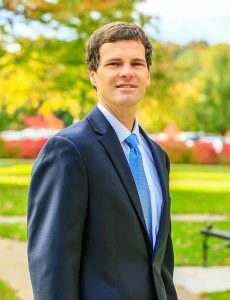 After graduating from Michigan Law, Mr. Springer worked intensively as a litigation associate for a significant LaSalle Street law firm in Chicago for four years, after which he served as the lead conflicts counsel (criminal defense) for the State Defender General’s Office in Windsor County, Vermont for two years. Brad then returned home to Grand Haven in West Michigan in 2004 to rejoin Scholten Fant, the first firm for which Brad had clerked while he was in law school. He has been chair of the firm’s Litigation section since 2007. Brad has extensive and detailed experience in a range of litigation matters, spanning both civil litigation and criminal defense. His civil litigation experience includes commercial litigation, municipal litigation, construction law and litigation, contract disputes, products liability and product recalls, will and trust contest litigation, election law litigation, and constitutional litigation. Brad’s experience in representing individuals accused of criminal violations includes investigations, misdemeanors, and felonies. A particular interest of Mr. Springer’s and a focus of his litigation practice is representing individuals in connection with violations of their constitutional civil rights by state actors. Brad has represented individuals in civil rights matters involving violations of the First Amendment, Fourth Amendment, Fifth Amendment, Sixth Amendment, Eighth Amendment, and Fourteenth Amendment to the United States Constitution. These constitutional rights include the right to free speech, the right to be free of unreasonable searches and seizures (including unlawful arrest), the right to constitutional protections during arrest and investigation, the right to basic needs while detained in jail pretrial or while incarcerated post conviction, the right to familial integrity such as during Child Protective Services (CPS) investigations, the right of equal access to community mental health services, and the right to Due Process and Equal Protection. A federal statute, 42 U.S.C. Section 1983 (often referred to as “Section 1983”), permits an individual to bring a private cause of action to vindicate a deprivation of a constitutional right if the deprivation was caused by a person acting under color of state law (i.e., a government or “state actor”), and Brad has represented numerous individuals in this regard. Brad has represented individuals with cases involving issues of police misconduct, deliberate indifference to serious medical needs while in pretrial detention, physical abuse by corrections officers during pretrial detention, and illegal and harmful denial of community mental health care services. See, e.g., Carl v. Muskegon County, et al., 763 F.3d 592 (6th Cir. 2014) (Published August 15, 2014). Mr. Springer also is a member of the firm’s School Law practice group. In his earlier years with the firm, his involvement with the School Law practice group was primarily litigation-based, representing school districts in contested hearings, cases, and other core litigation matters; however, in more recent years, his practice in the school law area has expanded to encompass the broad range of legal matters of interest to school districts beyond litigation defense, contested hearings, and risk management, including contract review, contract negotiation, policy analysis, and matters of interpretation and compliance with the Revised School Code, Public Employment Relations Act, Teachers’ Tenure Act, and other statutes and laws of particular concern to school districts. Mr. Springer is a member of the Michigan School Board Association’s Council of School Attorneys. Mr. Springer remains licensed in Illinois, Vermont, and Michigan, but his active license is in Michigan. Mr. Springer provides pro bono legal services to a non-profit organization based in Ottawa County and West Michigan that advocates for the humane treatment of prisoners and the wrongly convicted. He also is a longtime coach in a local recreational youth soccer league. In his personal life, Brad enjoys swimming, biking and running, but nothing as much as spending time with his family.